Winter is an unpredictable season that can leave you in some less than ideal situations. Slippery, snow-covered roads paired with reduced visibility increase the likelihood of collisions, breakdowns and road closures. The only thing worse than being stranded in your car is not being prepared! 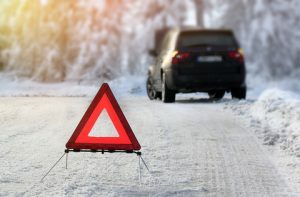 Read on as Freeway Auto Body lists what items you should have on hand in your vehicle to make sure you stay safe and warm this winter! If your vehicle is still drivable, you can use the following tools to help get your vehicle back on the road. If you feel uncomfortable at any time, remain in your vehicle and wait for help. Shovel. A shovel is not only useful for digging out your vehicle, but it also can help you keep your vehicle clear of snow (a visible car is much easier to spot than one that’s covered)! Windshield scraper. Don’t rely on your vehicle’s defrost system to clear your windshield. A windshield scraper and brush will help you to easily remove snow and ice from your vehicle. Traction Mats. Sometimes all that’s necessary to get your car out of the ditch is some extra traction. Traction mats are reusable and easy to store. Small tarp. A tarp will come in handy if you are performing any vehicle repairs as it will keep you dry, and help you from losing your tools in the snow. Flashlight. It’s important to be able to see what you’re doing! Don’t forget some extra batteries as well. Battery Booster. Consider purchasing a self-contained battery jumper so you don’t have to rely on another vehicle to jump start your engine. Water. Opt for plastic bottles as those won’t burst when the water freezes. Non-perishable food. Things like energy bars are great because they have a long shelf life and are packed with protein. Warm clothes. You can never have enough warm clothes in these situations! Always have some extra gloves, toques, jackets, snow pants and boots in your vehicle for you or your passengers. Blanket. Consider looking for an emergency blanket as they have a reflective inner layer that will help keep heat in. Candle and matches. If possible, place the candle in a deep can and use that to heat your car instead of turning on the vehicle. Warning lights or flares. These can help you track down help in the event that your car battery dies and you no longer have headlights or hazards. First Aid Kit. Make sure your first aid kit includes a seat belt cutter! If you find yourself in need of some auto body repair after a winter accident, bring your vehicle to the experts at Freeway Auto Body. We’ll work with the insurance company directly to make your job as easy as possible! Give us a call today to book your free quote.